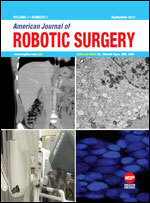 American Journal of Robotic Surgery (AJRS) is the first journal of its kind, focused on different aspects of robotic surgery and related peripheral research topics, a major step forward bringing Robotic Surgeons on board to a single platform. AJRS is one of the world's leading international journals, covering all the new and existing aspects of upcoming Robotic Surgery arena. The journal presents the editorials, up-to-date research papers, review articles, case studies, commentaries, randomized trials, innovation, newer surgical tips, and letter to editor on the latest surgical robotic procedures with audit and outcome studies in Robotic surgery and related basic sciences. Does the Current Peer Review Process Challenge Innovation? Is Next Hernia Repair Option Going to Help!! !